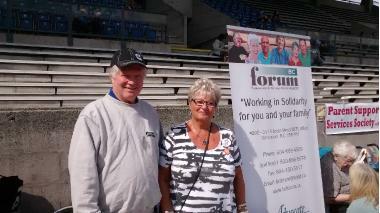 Labour Day, 2015 - Bill Silvester, First Vice-President and Diane Wood, President at the BC FORUM Booth, Labour Day Event, Swangard Stadium, Burnaby. 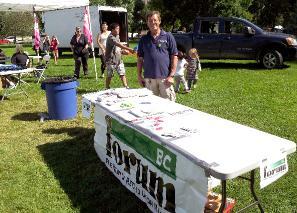 Labour Day, 2015 - At the Labour Day picnic in Kamloops, BC FORUM Regional Representative Mogen Jorgenson staffs the BC FORUM table. 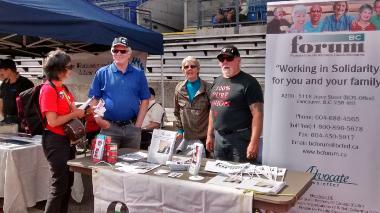 Labour Day, 2015 - BC FORUM at Labour Day at Swangard Stadium in Burnaby, BC: from left, Bill Silvester, 1st Vice-President, Barb Mikulec and Russ St. Eloi, BC FORUM Board Members. 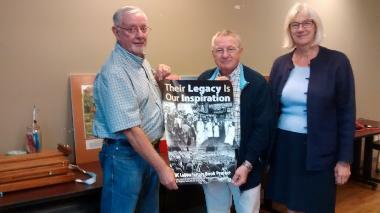 September, 2015 - At the BC FORUM Board meeting in September, Ken Novakowski, President of the BC Labour Heritage Centre (center), with John Savage, on left, Vice-President of BC FORUM, and Irene Lanzinger, Chair, BC FORUM Board and BC Fed President. 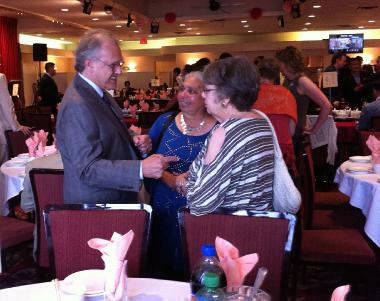 July, 2015 - Miriam Olney, BC FORUM Secretary, speaks with Stephen Lewis and Patsy George at the Libby Davies Tribute Dinner in Vancouver on July 26, 2015. Thanks to BC FORUM Board Member Maureen Shaw for the photo. 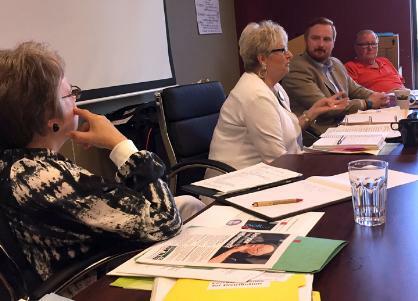 July, 2015 - BC Federation of Labour Secretary-Treasurer Aaron Ekman attended the July 2015 meeting of the BC FORUM Executive Board and is shown here third from left, with, from left, Miriam Olney, BC FORUM Secretary, Diane Wood, BC FORUM President and Gord Westrand, BC FORUM Treasurer. Thanks to Agnes Jackman, BC FORUM Executive Board member for the photo. 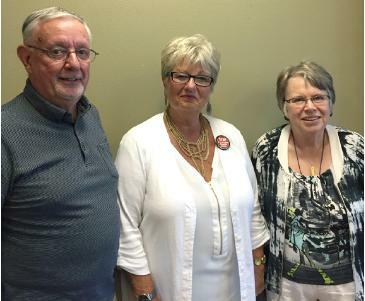 July, 2015 - BC FORUM Executive Officers were acclaimed for another two-year term at the July 2015 Executive Meeting: from left, John Savage, Second Vice President, Diane Wood, president, Miriam Olney, Secretary. Thanks to BC FORUM Executve Board Member Agnes Jackman for the photo. 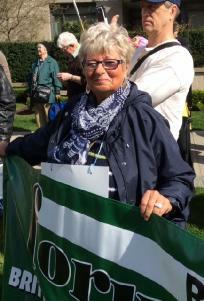 March, 2015 - BC FORUM president Diane Wood at a National Day of Action for Public Health rally at Vancouver General Hospital on March 31, 2015. Photo credit: Gudrun Langolf. 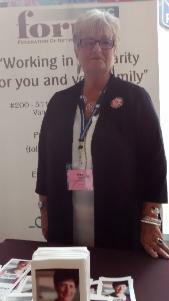 May, 2015 - BC FORUM president Diane Wood staffing the BC FORUM booth at the HSA Convention on May 1, 2015. 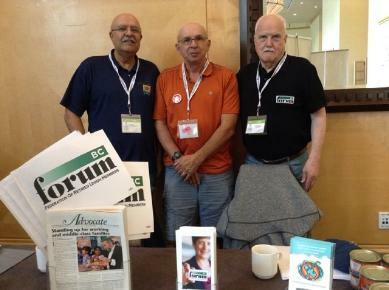 April, 2015 - BC FORUM attended this year’s CUPE Convention that took place in Vancouver at the end of April - many thanks to Gord Savard and Fred Girling, BC FORUM Board members, and joining them, on the left is Par Sihota, Community Savings Credit Union. May, 2015 - Diane Wood, Pres. 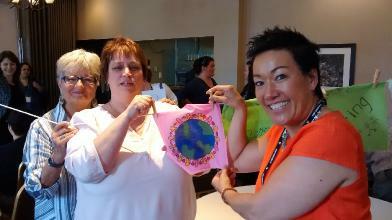 BC FORUM with BCGEU Sisters showing off their Combating Poverty in our Communities workshop project at BC Fed. Regional Conference, Terrace, May 23/15.